Need help understanding how big you can make your booth display? Learn the basics and prepare for your next show with these tips about rules & regulations. Generally speaking, there are four main types of booth displays that you’ll have to work with depending on your goals: Linear, Perimeter, Peninsula and Island. As always, it’s important to consult your show specific manual BEFORE your next big event, as regulations may vary by convention center and even within the show halls themselves depending on the situation. It is always recommended that you contact show management for any questions you have pertaining to specific regulations. Also commonly referred to as “in-line” booths, linear booths are usually arranged in a straight line. This puts neighboring exhibitors to your immediate left and right, leaving only a single side exposed to the isle. This configuration can be adapted to fit a corner booth, which would allow your exhibit to be exposed to isles on two sides. Note that hanging signs are usually not permitted in this configuration. Linear Booths are most commonly 10′ wide and 10′ deep, i.e. 10′ by 10′ (3.05m by 3.05m). The maximum height is 8′. This 8′ height may be maintained on the sidewall of your booth up to a distance of 5′ from the front aisle. A perimeter booth is essentially just a linear booth that backs to an outside wall of the exhibit facility, rather than to another exhibit located immediately behind yours. The maximum height for these booths is normally 12′, which may be maintained up to a distance of 5′ from the front isle. Any remaining length of sidewall can be no higher than 4′. Note that hanging signs are usually not permitted in this configuration. A peninsula booth gets its name from the fact that it is exposed to aisles on three full sides. It is usually comprised of a minimum of four booths. There are two different types of peninsula booths to choose from depending on your needs: one that backs to linear booths and one that backs to another peninsula booth. This latter setup would be referred to as a “split island booth” in official documentation. It’s always important to keep in mind that for all peninsula booths, the exterior of the back wall MUST be finished and cannot contain logos, advertisements or any other identifying information. If backed by a row of common linear booths, the back wall of your peninsula booth can be no higher than 4′ for a distance of 5′ from both side aisles and 16′ to 20′ high in the center of the back wall. These height restrictions are in place for a distance of 10′ from the back wall. 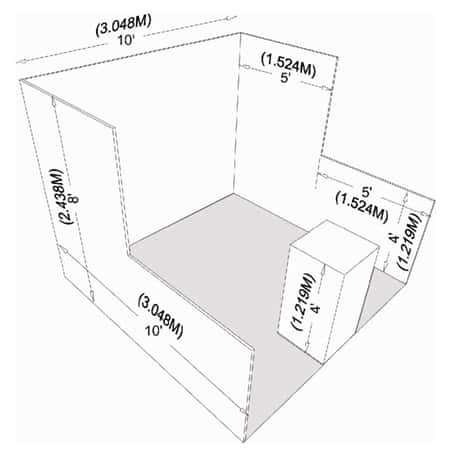 For a split island booth, the maximum height is between 16′ and 20′ in all areas of the booth, no exceptions. If your booth is exposed to aisles on all four sides, you have what is traditionally referred to as an island booth. These exhibits are normally 20′ by 20′ or larger. The entire space can be used up to the maximum allowable height, which ranges from 16′ to 20′ depending on the situation, including all signage. Note that hanging signs are permitted above all island booths. Multi-story exhibits may be allowable depending on the venue, which are any booth where the display fixture includes two or more levels. Any canopies (including things like ceilings, umbrellas and canopy frames) that you choose to use can be either decorative or functional, but you should always comply to all line-of-sight requirements for your venue. Most exhibition rules allow hanging signs and graphics for all peninsula and island booths, but they always need to comply with all ordinary use-of-space requirements and will usually be subject to prior approval. In terms of lighting, its important to remember that no lighting, fixtures, lighting trusses or overhead lighting are allowed outside the boundaries of your exhibit space. All lighting must also be directed INWARD towards your booth space instead of outward. Lighting that is potentially harmful will not be allowed without prior approval from exhibition management and safety rules and regulations regarding fire hazards will always apply.